GENIVI will soon celebrate its 10th anniversary, having launched at CeBIT in March of 2009. Many of you are aware of the impact GENIVI has had on the automotive software industry and it is time for an expanded scope including a series of new projects. In this newsletter, you will learn more about the new GENIVI target of integrating multiple in-vehicle operating systems in the vehicle cockpit. GENIVI welcomes your feedback and interest in the two new projects forming in this new scope. The next gathering of GENIVI will be in Munich on 14-16 May. The latter two days of that event are open to any participant, so let me take this opportunity to personally invite you and please see details below. GENIVI had another great CES with new participation records at our panel sessions and in our showcase and reception. Links to the videos of the sessions and pictures of our reception can be found below. And learn more about GENIVI participating in several industry events coming soon, especially the NAB Show in April. On behalf of GENIVI, I want to thank you for your continued interest in the GENIVI Alliance and I welcome any questions and feedback. GENIVI is advancing its work into an expanded mission of helping OEMs and their suppliers efficiently integrate the multitude of operating environments in the vehicle cockpit (see press release). GENIVI gathered input from several automakers, both members and non-members, in December 2018 and found interest for two new projects that are currently being chartered. GENIVI will return to Munich on 14-16 May 2019 for the next All Member Meeting and Open Community Days. The event will be held at the Munich Marriott Hotel beginning the afternoon of the 14th and ending late afternoon on the 16th. This year’s program will target our new, expanded scope of integrating multiple operating systems in the vehicle cockpit. In addition to the continuation of the active domain interaction projects in hypervisor APIs, display sharing, and operating system interoperability using generic communication protocols, GENIVI will have at least two new projects, including a special interest group (SIG) for adopters of Android, launched in this new expanded scope. GENIVI continued to grow its presence and impact during Consumer Electronics Show (CES 2019) last month. Participation records were again exceeded for the Connect2Car program in collaboration with SAE, which included two panel sessions led by GENIVI. The GENIVI CES Showcase and Networking Reception again surpassed last year’s event with 1,200 in attendance including representatives from 16 OEM organizations. GENIVI has been working with the National Association of Broadcasters (NAB) for several months to ensure the radio broadcast industry is better engaged with the automotive industry to drive the future of in-vehicle entertainment. This year’s NAB Show will provide multiple opportunities for representatives from the automotive and radio industries to engage including a GENIVI-hosted VIP reception in the In-Vehicle Experience pavilion on Monday, April 8. As the industry moves toward combining multiple vehicle cockpit domains (IVI, cluster, connected devices) into a single silicon solution, often with multiple operating systems, automakers are exploring the concept of a central compute platform, coined by some in the market as cockpit computing. GENIVI gathered input from several automakers, both members and non-members, in December 2018 and found interest for two new projects that are currently being chartered. Automakers who have positioned Android as a solution for the current and future infotainment will participate in a project focused on identifying gaps in the “out of the box” Android for automotive and align their inputs for further discussion with Google’s Android team. During a meeting at CES, the Google Android team expressed a willingness to participate in the discussions created by this first project, nicknamed “Android SIG”. A second project will explore how to better integrate multiple operating systems (Linux, Android, QNX, AUTOSAR, RTOS’) so that they interoperate efficiently in a consolidated architecture. This latter project may also explore solutions that are independent of any specific operating system and that also quickly adapts to the latest available version of the underlying operating system. GENIVI has opened discussions with these OS vendors and organizations to also participate and inputs received so far are favorable. A draft project charter for the “Android SIG” will be reviewed by automakers during the first week of March and a full project kick-off is planned prior to the end of March. The content for the “Multi-OS Integration" project is still being collected, but the scope of this project is similar to work already being done in the GENIVI vehicle domain interaction projects, leaving room for those projects to expand rather than starting a new project. For more information on the two new projects or to sign up to participate, please contact the GENIVI Executive Director, Steve Crumb at scrumb@genivi.org. GENIVI will return to Munich on 14-16 May 2019 for the next All Member Meeting and Open Community Days. The event will be held at the Munich Marriott Hotel beginning at 1300 on the 14th and ending late afternoon on the 16th. The popular Showcase and Reception will be held on the evening of the 15th where at least 25 organizations will be on hand to share demonstrations and discuss their products and services that relate to the vehicle cockpit. The program, to be released in early March, will highlight keynotes and panels related to the scope expansion into other operating systems like Android, AUTOSAR and others. Registration for the event is open to both GENIVI members and non-members. Visit the registration site here. The first panel moderated by Matt Jones entitled “Connecting the Autonomous World” enjoyed the largest audience with 440 participants. The second panel moderated by John Ellis entitled “The Future of In Vehicle Infotainment” enjoyed a healthy 330 attendees. Pictures of both panels can be found at https://genivi.smugmug.com/2019-Connect2Car. The GENIVI CES Showcase and Networking Reception again surpassed last year’s event with 1,200 in attendance including representatives from 16 OEM organizations. The event also featured almost 70 demo tables including a start-up pavilion sponsored by PlanetM/Michigan Department of Economic Development and a “future of radio” pavilion sponsored by the National Association of Broadcasters, who also provided on-screen graphics and a live concert at the close of the evening. 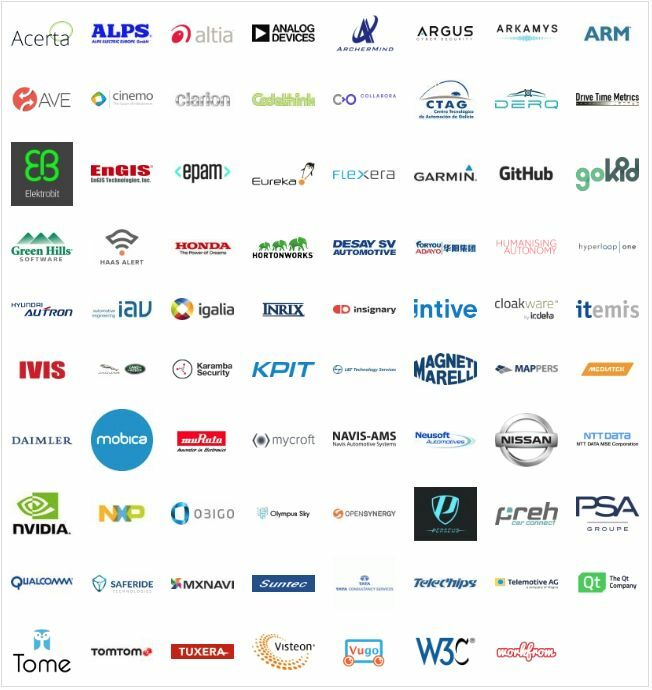 In addition, GENIVI would like to thank our generous sponsors including: Mentor Automotive, Robert Bosch, Hortonworks, Harman, Cloakware by irdeto, Luxoft, Flexera, Altia, BMW Group, Argus Cyber Security, ESG Automotive, Tuxera, The Qt Company and Access Company. Another highlight of the showcase was two tables demonstrating work from the GENIVI domain interaction projects including the RAMSES software demo and the AUTOSAR/GENIVI Interoperability demo. Pictures of the showcase and demonstration tables can be found at https://genivi.smugmug.com/2019-CES-GENIVI-Reception/CES2019/. Finally, GENIVI representatives held many sidebar meetings aimed at expanding our work in areas such as automotive cybersecurity and in standardization of virtual graphics environments through a new collaboration between the GENIVI Hypervisor Project and the newly launched Vulkan® Safety Critical Working Group of the Khronos Group. Thought leadership presentations in the pavilion on the themes of In-vehicle Entertainment and the Passenger Economy. Additionally, GENIVI will be hosting a VIP reception in the In-Vehicle Experience pavilion on Monday, April 8 at 4:30pm where participants can mix and mingle with broadcast, auto, media and other tech industry executives. For more information on this VIP reception, please contact Mike Nunnery.